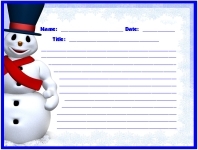 Are you looking for colorful language arts worksheets for a variety of different school and holiday writing topics? Are you looking for a way to create a quick bulletin board display of your students' work that is eye catching and brightens up your classroom for a special holiday or event? 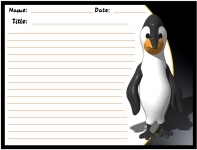 students to use all year long! resource sets that are found on this page. 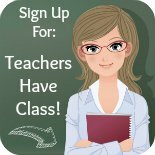 If you click on the underlined link at the bottom of each box, you will be taken to the page that shows larger pictures of the printable worksheets, as well as a large image of the matching 5 page bulletin board display banner. These chalkboard printable worksheets are perfect for a Back to School theme. 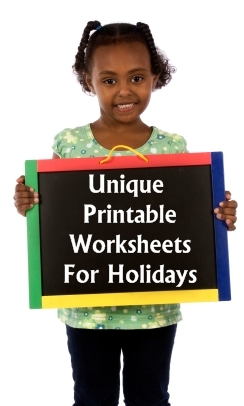 There are separate worksheets designed especially for Grades 1 - 8. Students will Hop on Board with creative writing using these printable worksheets that are perfect for a Back to School theme. 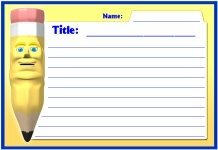 These printable worksheets contain pencil and file folder graphics and would be appropriate for a wide range of creative writing topics. Students write about ways to help protect the environment. 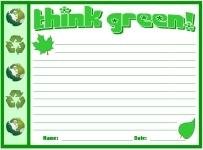 This set also includes a Think Green Recycling sticker chart and a matching award certificate. For these Peace Day worksheets, students write a letter to the President or a world leader. Peace Day is celebrated on September 21. These unique dove templates for Peace Day on September 21 will make an eye catching bulletin board display of your students creative writing assignments. 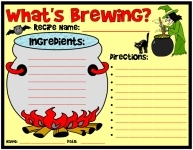 For these Halloween worksheets, students can create a recipe for a special witch's brew or they can write the ingredients for their favorite recipe. 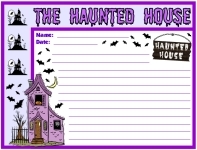 Your students will enjoy writing a spooky story about a haunted house during October with these Halloween language arts worksheets. Your students will enjoy this spooky creative writing assignment. 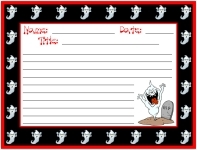 Students write ghostly tales using these Halloween language arts worksheets. 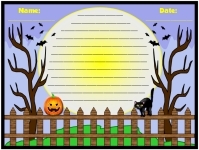 For this October assignment, students can write a short story or a poem about the topic "One Spooky Night" using these Halloween printable worksheets. 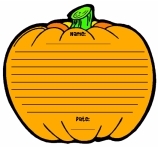 Students can cut out these Halloween language arts worksheets along the thick border and then they will have fun pumpkin shaped templates to write on. "Frankly We Think Our Work Is Great!" is a shorter Halloween writing assignment, so it would be ideal to use for a spooky Halloween poetry writing activity. "Witch Story Do You Like Best?" 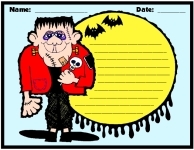 is a Halloween language arts worksheet that focuses on reading and students write an essay about their favorite books. Your students will enjoy writing a spooky story about Halloween Characters during October with these Halloween printable worksheets. These printable worksheets for the month of October contain pumpkin graphics and would appropriate for a wide range of creative writing topics. For this creative writing assignment, students write spooky stories set in a graveyard with these Halloween language arts worksheets. 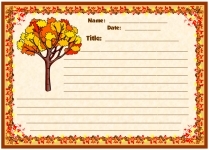 These printable worksheets for the fall season contain leaf graphics and would appropriate for a wide range of creative writing topics. 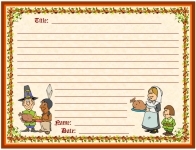 These worksheets contain graphics of pilgrims and would be ideal for a creative writing topic about the first Thanksgiving or preparing a Thanksgiving dinner. Your students will gobble up these Thanksgiving language arts worksheets. 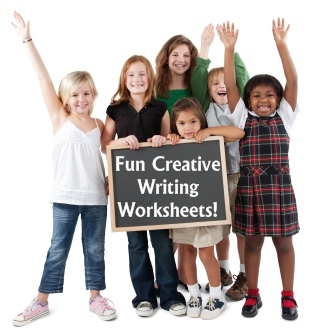 These writing worksheets can be used for a wide range of creative writing topics. These fall harvest language arts worksheets are ideal for a wide range of creative writing topics and will make a colorful fall bulletin board display. 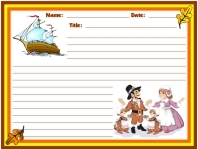 These worksheets contain graphics of the Mayflower and pilgrims and would be ideal for a creative writing topic about the first Thanksgiving or the Mayflower. 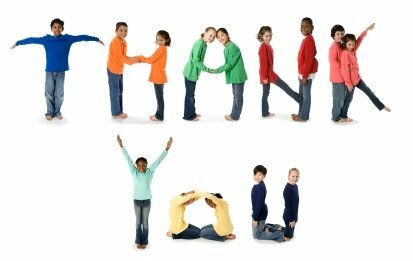 Thanksgiving and Fall are perfect times of the year to have your students write thank you letters to someone that they are thankful for. Your students will have fun creating flip books using these Groundhog Day creative writing templates and booklet covers. 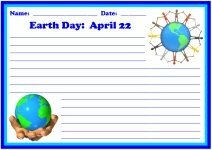 Earth Day is on April 22 and you can use these printable worksheets to have your students write an essay about ways that they can help protect our planet. 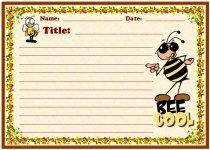 I use these We Are Busy Bees language arts worksheets in the spring, but they can be used any time of the year for a wide variety of creative writing topics. 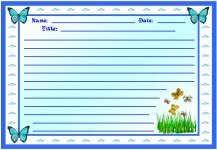 I use these Colorful Butterfly language arts worksheets in the spring, but they can be used any time of the year for a wide variety of creative writing topics. 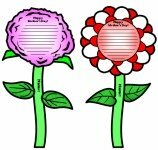 I designed these Our Writing is Blooming! 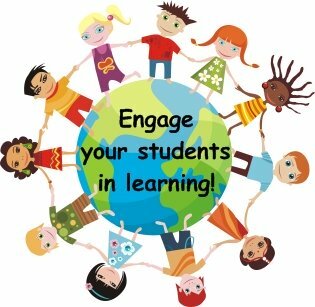 language arts worksheets for the spring, but they can be used any time of the school year. 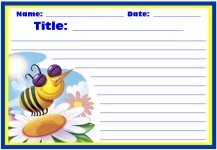 Your students will Bee Cool as they write stories using these colorful language arts worksheets that are appropriate for a wide variety of different topics. Every mother loves to receive flowers on Mother's Day! 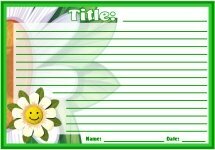 Students write Mother's Day poems or messages inside these unique flower templates. 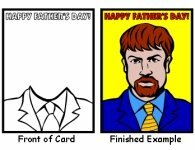 Students draw a portrait of their father on the coat and tie graphic on the front of the Father's Day card, and write a message or poem on the inside of their cards. Have your students write a short essay or a poem about Flag Day using these printable worksheets that are in the shape of the United States and a flag. Students can write about their favorite vacation, or they can use their imaginations to describe what they think would be a perfect summer vacation. 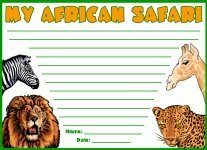 For this creative writing assignment, students imagine that they are on an African safari and write all about their adventures. 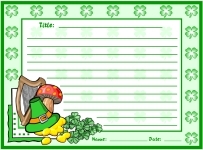 Each of my worksheet sets that you will find on this page also contains a free 5 page bulletin board display banner. By using the colorful printable worksheets and the large display banner, you will be able to easily design an eye-catching and colorful bulletin board display featuring your students' work that everyone will notice. It is often difficult to get students enthusiastic about completing creative writing assignments on traditional language arts worksheets or plain lined paper. I have found that my students immediately become more interested in writing activities when the creative writing worksheets are colorful and have interesting writing topics. When I give my students unique and fun language arts worksheets to write their final drafts on, I have found that they tend to use their best effort and they are more careful to not make careless spelling, grammar, and punctuation errors. 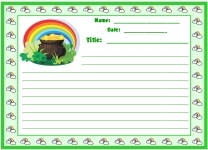 Thank you for visiting my Printable Worksheets page.